DALLAS, TX — The Official Currency Auction of the 2010 Memphis International Paper Money Show in Memphis will be conducted by Heritage Auctions June 17-21. The auction will include three floor sessions and an online session. Lot viewing will be conducted at the Cook Convention Center, East Hall, 225 N. Main Street in Memphis, and the floor sessions will be held at the Memphis Marriott Downtown, Heritage Ballroom, 250 North Main Street. Session One will begin on Thursday evening, June 17, at 6 p.m. CST, and includes World Currency, Canadian Currency, Miscellaneous, Continental Currency, Colonials, Fractional Currency, Obsoletes, Confederate Notes, and Military Payment Certificates. 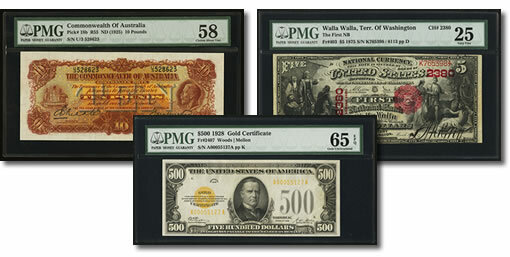 Heritage Currency Auctions is pleased to present a large selection of World notes as part of Session One. Eighty one countries will be represented by the 226 lots being offered. 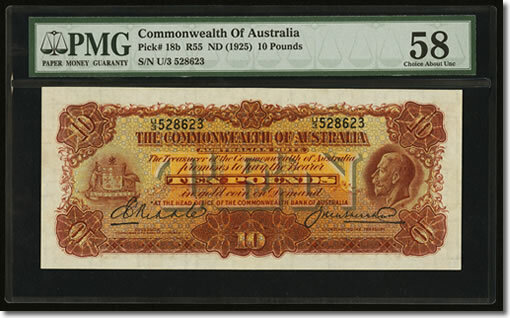 Featured lots include: Australia Commonwealth of Australia £10 ND (1927) Pick 18b R55 PMG Choice About Unc 58, Hawaii Republic of Hawaii Silver Certificate of Deposit $10 1895 (1897) Pick 12a PCGS Fine 12, and a Palestine £10 Palestine Currency Board 1929 Pick 9b PMG Choice Very Fine 35. The Canadian offerings include a BC-19 $1000 1935 PMG Gem Uncirculated 65 EPQ and a Halifax, NS- The Bank of Nova Scotia $100 1929 Ch # 550-28-40 PMG Very Fine 20. Additional Session One highlights include: an extremely rare "Independence" Sword in Hand Note Massachusetts November 17, 1776 36s PMG Choice Very Fine 35; a Maryland July 26, 1775 $1 1/3 PMG Choice Fine 15 Allegorical Note; fourteen group lots of Obsoletes from the Bank of the State of South Carolina, among them Charleston, SC- Bank of the State of South Carolina Fractional Notes, Including Several Unlisted Varieties; a Confederate T6 $50 1861 PMG Choice Uncirculated 64 EPQ; a rare Ball 277 Cr. 137 $5000 1863 Four Per Cent Call Certificate PMG Very Fine 20; and Military Payment Certificate Series 661 $10 PMG Gem Uncirculated 65 EPQ. Small Size Notes, Error Notes, and Large Size Notes will be featured during Session Two beginning on Friday, June 18 at 6 p.m. CST. Among the Small Size selections are newly discovered $5,000 and $10,000 Federal Reserve Notes from the Dallas district Fr. 2221-K $5000 1934 LGS FRN Note PMG Very Fine 30 and Fr. 2231-K $10000 1934 FRN PCGS Apparent Very Fine 25, and a gorgeous Fr. 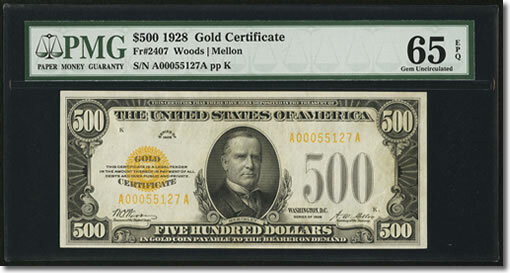 2407 $500 1928 Gold Certificate PMG Gem Uncirculated 65 EPQ. A number of outstanding Error Notes will be presented, including the "King of Errors," a Fr. 964/Fr. 904 $20/$10 1914 Double Denomination FRN PCGS About New 50, and a Skaneateles, NY – $10 1929 Ty. 1 The NB of Skaneateles Ch. # 5360 with a rare inverted overprint of the black ink portion. Large Size offerings include a Fr. 1072a $100 1914 Red Seal FRN PMG Gem Uncirculated 66 EPQ that is tied for finest known and the Ten Note Federal Reserve Proof Presentation Set Number 1 that was presented by Secretary of the Treasury William G. McAdoo on December 21, 1914. National Bank Notes will be sold during Session Three, on Saturday, June 19 at 6 p.m. CST. Heritage is pleased to present Part I of the Old Line Collection, a collection that includes many rarities from numerous states and territories. Part I contains a large number of California and Virginia notes, many with impressive pedigrees. Session Three also includes Part II of the Don C. Kelly Collection of Ohio National Bank Notes as well as Part III of selections from the Lone Star Collection, an assemblage of National Bank Notes formed over three decades consisting of the very finest notes that could be obtained from Arkansas, Oklahoma and Texas. 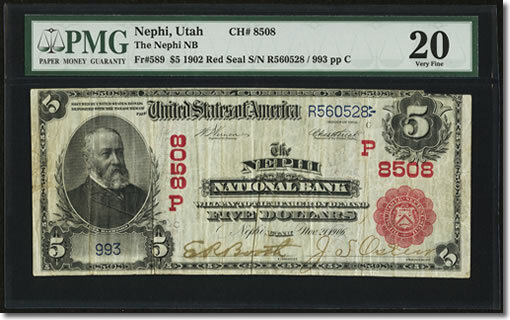 A newly discovered Nephi, UT – $5 1902 Red Seal Fr. 589 The Nephi NB Ch. # (P)8508 PMG Very Fine 20 that becomes the finest known Utah Red Seal is among the highlights found in the Session Three material. 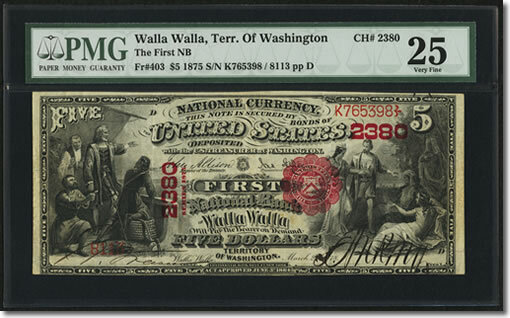 Another incredible note is the Walla Walla, Washington Territory – $5 1875 Fr. 403 The First NB Ch. # 2380 PMG Very Fine 25, one of three known First Charter Washington Territorials. A Serial Number One Flagstaff, AZ – $5 1902 Plain Back Fr. 606 The First NB Ch. # (P)11120 PMG Choice Uncirculated 64 EPQ is among the featured lots. A unique double denomination Small Size National Bank Note, a Seattle, WA – $20/$10 Double Denomination 1929 Ty. 1 First Seattle Dexter Horton NB Ch. # 11280 PMG Very Fine 20 Net is sure to attract attention as well. Also being offered during Session Three is The Piedmont Collection of North Carolina National Bank Notes, one of the finest collections of North Carolina National Bank Notes ever assembled, and certainly the finest presented at public auction. A total of 107 Large Size and one exceptional Small Size note are included. In addition to unique notes; serial number one, type note, and high grade rarities abound in this collection. The Piedmont Collection is being offered as a single lot and includes among other things a number of post cards and a few other pieces of ephemera. All three Signature Sessions include incredible notes from the C.A. Dolph & Son Collection; an assemblage that was formed from the 1920’s to the 1940’s and had remained undisturbed for six decades. Among the offerings are three previously unknown Defiance Mining Company California Obsoletes, including a Darwin, CA- Defiance Mining Company $10 June 27, 1876 PMG Choice Fine 15 Net. Another of the many rarities is a Putnam, CT – $10 1882 Brown Back Fr. 485 The Thompson NB Ch. # 1477 PMG Very Fine 25, an unreported title from the state. The Non-Floor Session of the 2010 Memphis Heritage Currency Auction will be available for viewing in Memphis and closes on Heritage Live on Monday, June 21, starting at 12:00 p.m. CST. Among the 1300+ lots being offered are an additional 199 lots of World material. Heritage Auctions, headed by Steve Ivy, Jim Halperin and Greg Rohan, is the world’s third largest auction house, with annual sales more than $600 million, and 500,000+ registered online bidder members. For more information about Heritage Auctions, and to join and gain access to a complete record of prices realized, along with full-color, enlargeable photos of each lot, please visit HA.com.